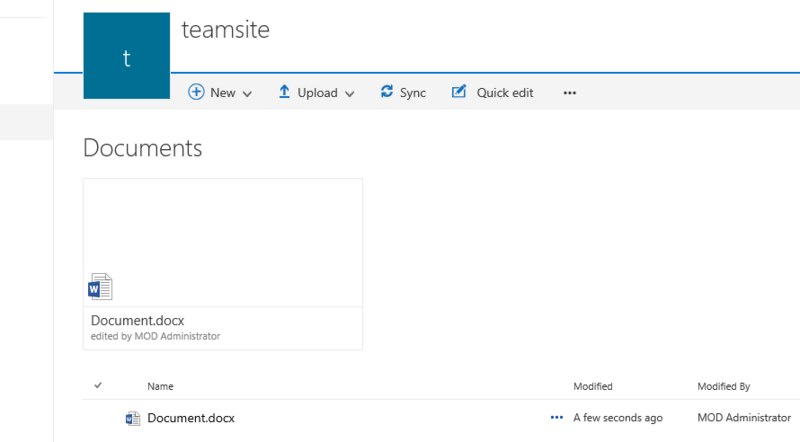 After yesterday’s post about the new site contents in Office 365, today the new document library look and feel. It has been around for a little longer now and I’m starting to get used to it a little bit. The main issue of course is still navigation around. Once you visit a document library how do you get back to your intranet or even more important how do you get back to your sub site. Earlier I already described the views menu, so I ‘m going to skip that now. 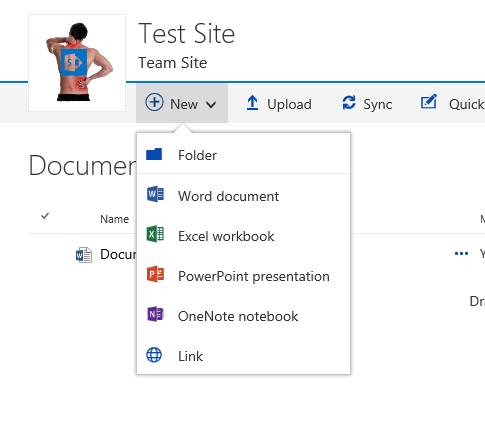 In the New document menu there are still the options to create a folder and all sorts of Office files. But the Link seems to be new. 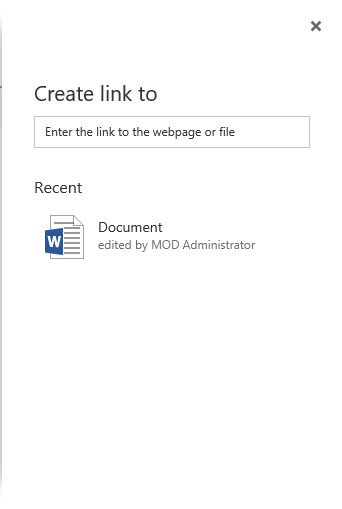 When clicking on the new link a form appears asking the user to add a link offering recent documents. Well this is an improvement. How often would you like a document to appear in two locations? Even though you know that documents shouldn’t have multiple copies. Now you can just add a link. As soon as the link is created a .url file is added to the library. Note that the link still needs to be checked in. So what can we do with this link? I tried the download option. What should I expect to happen. just the .url file or the actual document? When I check the file properties, I’m finding the url to my document. So what else can you do with this link. 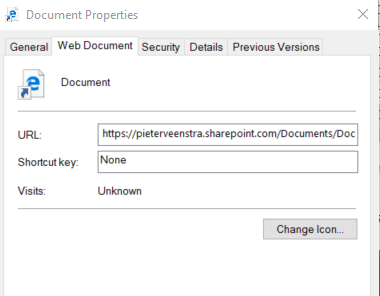 Well I went back to my SharePoint library and clicked on the link. The document is now opened in Word. So it works just the same way as my actual document. the upload link in the menu still does the same as before. So nothing new. 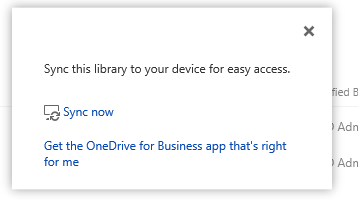 The sync option helps a user setting up OneDrive for Business Synchronisa tion. 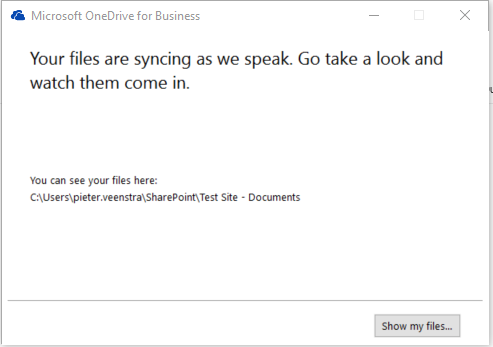 Clicking on the Sync link give a few short dialogs. The first dialog simply click on the Sync now to synchronise the current library. If a library hasn’t been synchronised before then an additional dialog will appear confirming that you want to synchronise the library. 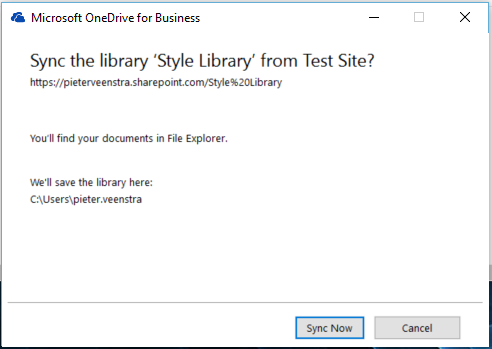 Once the library has been synchronised OneDrive for Business will respond with a “Your files are syncing as we speak” Message. The quick edit options haven’t really changed at all giving the user still the easy way to update many list items. Maybe it is time to apply the new look and feel to lists as well. Then now the major pain point, navigation. There is no global navigation or local navigation within my library. Even though my actual site does have these configured. I have found the easiest way, simply navigate back to the site by clicking on the site logo within the library. After that you can use your normal navigation options again. When you upload a new document there isn’t a form that you can fill in anymore. Or at least it isn’t presented to the user o upload. 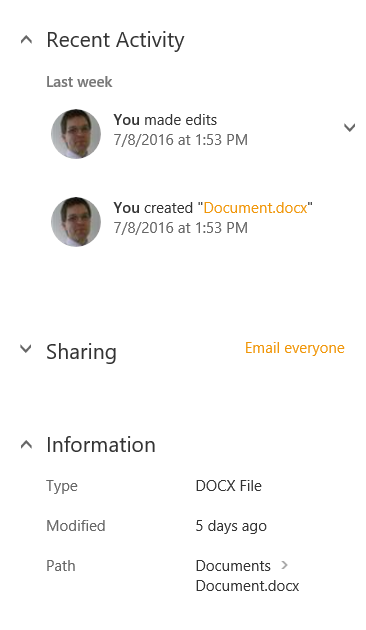 When you select the uploaded document and then click on the i icon at the right top you will find form that appears. It’s a bit hidden away but the form is still there. In the information panel you can also find recent activity on the document and other information like who the document is shared with. As you’ve noticed Nintex managed to add their application to the menu. 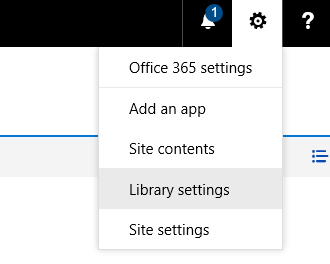 So who told you couldn’t have custom menu options in the new look document library. One of the options mentioned above is pinning documents to the top of your library. Maybe this is an interesting option when there are many documents in your library. But it could even get better if you create a link to a document in a different library and then pin that link. you will then find that you can point users to documents in different libraries.